Prolonging the life of your deck can be accomplished with seasonal maintenance, and the type of deck you have will dictate your schedule and process. Q: I installed a new deck last year. What steps can I take to maintain the deck and keep it looking nice? A: A deck is a significant investment, so of course you want to protect it and extend its lifespan. Prolonging the life of your deck (a well-built deck can last several decades if maintained properly) can be accomplished with seasonal maintenance. Think of it like putting on sunscreen: If you wait to see the sunburn, the sunscreen won’t be much help. But if you apply the sunscreen before you begin to burn, you spare yourself the discomfort. In the same way, your deck needs protection from the elements. It will last longest and look best if you reapply that coverage before it has worn away. The type of deck you have will dictate your maintenance schedule and process. There are two primary types of decking materials: wood, which generally requires staining and refinishing every year or so, and manufactured materials, which can easily be cleaned once or twice a year using one of the many easy-to-use products available for that purpose. Here are the basic steps you should take to keep each of them looking nice for the long haul. Cedar can last more than 25 years with proper care, which includes routine cleaning and restaining — and may involve stripping and restaining. 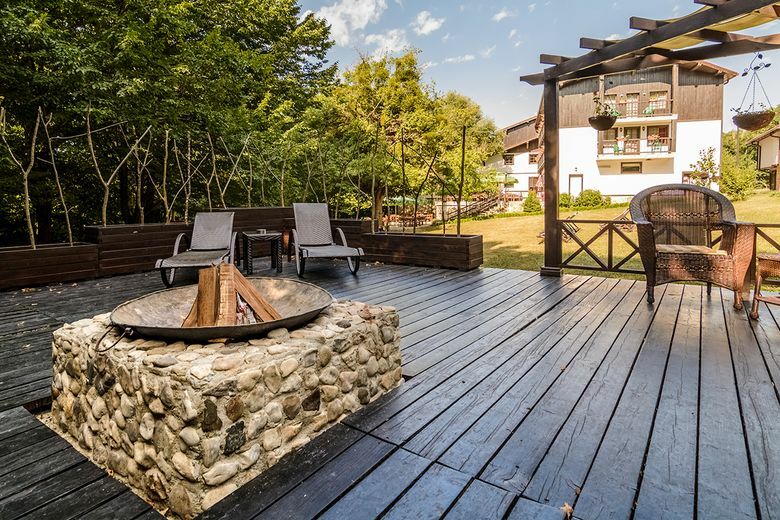 Modified softwoods such as Kebony offer a durable, stable, rot-resistant board, which requires no maintenance beyond regular cleaning as long as you’re comfortable allowing the boards to weather to a natural gray color. Rot-resistant hardwood lumber species such as ipe, tigerwood and batu will stand the test of time. With regular maintenance and refinishing, they’ll retain their color and appearance. Or, if you simply want to clean them, they’ll weather to gray. Allow new (green) wood to dry — anywhere from four to 12 months depending on your area’s climate and time of year. It’s ideal to allow the wood to season to a 15 percent or less moisture reading. The seasoning process goes a long way toward helping prepare the wood for accepting the stain product (and the results are worth it). Be mindful of temperature and weather. Many deck stain manufacturers say their product works best when applied in temperatures between 60 and 80 degrees but shouldn’t be applied in conditions below 50, or if the temperature will drop below 32 degrees within eight hours. Don’t apply your deck coating if rain is expected within 24 hours. In every scenario, clean your deck first. From clean-looking decks to surfaces caked with dirt, you will never create challenges by doing an extra cleaning. Remember to read the cleaning instructions, which will help you take the right steps to protect your plants, siding and hardscapes. After a thorough cleaning, be sure to evaluate if your deck could benefit from an application of wood brightener. Capped-composite deck boards are even more resistant to fading and scratches. These products are very durable and clean easier than older composite blends because of their hard, exterior cap (or shell). PVC is a wood-alternative decking surface that excels in its durability, scratch, stain, fade resistance and warranty (up to 30 years!). It’s also a great low-maintenance option which cleans easily since its surface isn’t porous. Regardless of the material, checking in on your deck regularly and performing routine maintenance will protect your investment for many years. That’s decades of barbecues, parties and late-night fireside chats — with only a little work required, once or twice a year. Jim Coshow is the vice president of sales and marketing at Dunn Lumber and a member of the Master Builders Association of King and Snohomish Counties (MBAKS). If you have a home improvement, remodeling or residential homebuilding question you’d like answered by one of the MBAKS’s nearly 3,000 members, write to homework@mbaks.com.